Performers include: Derek Luke, Cliff Curtis, Anastasia Griffith, Aimee Garcia, Jamey Sheridan, and Billy Lush. Instead of being centered around a hospital like most medical dramas, most of the action in this series takes place “in the field,” where the traumas happen. 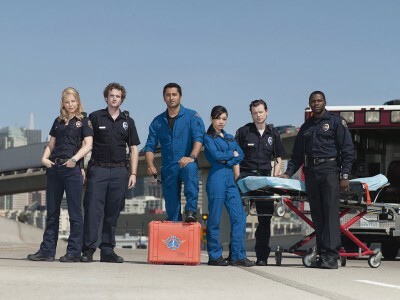 It follows the first professionals on the scene, the first responder paramedics. The trauma team that travels to these emergencies is based out of San Francisco City Hospital. They move by whatever means they have to get there — by land, sea, or air; whichever will get them there the quickest. They must be ready to respond wherever they’re needed, under the most extreme conditions. Reuben “Rabbit” Palchuk (Cliff Curtis) is a flight medic for Angel Rescue 2 and a survivor of a helicopter crash — the worst rescue disaster in San Francisco history. No one can decide whether it’s more genius or madness that drives him, but most figure it’s probably somewhere in between. He’s full of bravado, yet has a reason to be with the talent he has. He’s also quite the ladies’ man. Marisa Benez (Aimee Garcia) is Rabbit’s new pilot. An Iraqi war vet, she doesn’t take crap from anyone, including him. While he’s a genius working on the human machine, she’s a genius on mechanics. Nancy Carnahan (Anastasia Griffith) graduated from med school to make her physician dad happy, but before beginning her internship, she took a detour and ended up a paramedic instead. She lost her partner in the helicopter crash, and it’s left her questioning many things. She’s great helping the patients, but not so good at helping herself. Glenn Morrison (Taylor Kinney) is Nancy’s new EMT partner for Medic 114. He’s a rookie, which isn’t what she was looking for. He’s naive, yet determined to not get overwhelmed. Cameron Boone (Derek Luke), the paramedic side of Medic 78, is also bothered by memories of the air disaster. While he was once devoted to family and work, the loss of his two close friends has caused him to stray from those core values. Tyler Briggs (Kevin Rankin) is the EMT half of Medic 78. He’s been an EMT in almost every major city in the U.S., but has been in San Francisco the longest. He’s Boone’s subordinate in rank, but they work as equals. They’ve worked together so long they can almost read each other’s minds. Dr. Joseph Saviano (Jamey Sheridan) is sometimes referred to as the godfather of San Francisco City Hospital. He sees it all and doesn’t seem to be affected by any of it, having been trained to stay detached from what he sees. However, when it comes to his own, there’s no doubt he’s closer than he probably should be. He treats Nancy like a daughter and Rabbit like the little brother who’s always screwing up. Nancy has a nightmare where she tries to gives herself CPR. She wakes up, gasping for breath. Luckily Rabbit’s there to calm her nerves. Rabbit has a surprise that may scare Nancy worse than her nightmare: a proposal to take their relationship to the next level and get a place together. Nancy doesn’t give Rabbit an answer. At the trauma center, Boone wishes Tyler a happy birthday. All’s not happy though, as dispatch is having major technical problems. This makes it increasingly difficult for Rabbit and Marisa to find a man who has been severely injured in an all-terrain vehicle (ATV) accident. The man crashed into barbed wire and lacerated his neck. Marisa and Rabbit get to the injured man after 20 minutes, which Rabbit thinks was too long. Rabbit and Marisa transfer him to the hospital just in time. Marisa’s army friend Casey calls to say he’s back from the war and at the VA hospital. When Marisa visits the VA, he greets her in a wheelchair, but only as a joke, which Marisa doesn’t think is funny at all. Casey says he was shot in Afghanistan and has been discharged. This means they can spend some quality time together, and Casey will be crashing on Marisa’s couch. Tyler and Boone give dispatch a hard time. They answer a call at a laundromat, but when they get there, no one’s hurt. Tyler tells Caroline the dispatcher that he and Boone are at the wrong address – someone may be dying somewhere else! Meanwhile, Nancy and Glenn tend to a woman dying of breast cancer who wants to be admitted to the hospital. Nancy is touched when she sees how the woman has lived her life to the fullest. Nancy brings the dying woman to the hospital so she can receive end-of-life care in the cancer ward. Glenn notices Nancy seems a bit shaken up, but she walks it out. Rabbit’s happy to hear that Casey’s alive and back in the States. Rabbit’s also impressed that Casey’s come back to be with Marisa again, which probably means she’s “a cat in the sack.” Later, Nancy tries to contact Rabbit, but he doesn’t hear his phone. Nancy asks Glenn if he’s ever been to Cambodia, and he tells her that he actually backpacked through Vietnam. Nancy tells Glenn she’s sick of looking after people; maybe it’s time for her to take care of herself. Tyler complains to Boone about dispatch’s technical issues. He wants a good reason why communication is down. Tyler doesn’t think 911 should screw up, especially on his birthday. Rabbit tries to return Nancy’s phone call, but she doesn’t answer. Casey takes Marisa to a shooting range and talks to her about his experience on the ground in the war. It seems as though Casey really had a hard time with face-to-face combat. While Nancy tries to contact Rabbit, a good-looking man at the café gives Nancy his card and tells her to call him if she can’t find her boyfriend. Tyler asks Boone not to plan a birthday party for him because he’s got plans with some other friends he knows Boone won’t like. Rabbit talks to Marisa about her lunch date with Casey. He’s concerned that Casey may not adjust to civilian life as easily as Marisa hopes. Tyler and Boone meet up with Nancy and Glenn at a call where a man named Max has been severely injured in an explosion. Max’s brother has been waiting for the paramedics for almost half an hour. By the time Max gets to the hospital, it’s too late to save him. At the hospital, Tyler has had enough of dispatch’s poor communication, so he decides to give them a piece of his mind. Tyler talks to the woman in charge of dispatch to see what’s going on. The communications systems have crashed and the GPS systems are down, which means they have no way of telling where the ambulances are. Feeling up to the challenge, Tyler tries to do one of the dispatchers’ jobs and finds that it’s not as easy as he thought. Nancy tells Glenn that her mother died of breast cancer at 43, and never traveled anywhere besides Canada and Mexico. Meanwhile Casey tells Marisa how happy he is to be “out of the sand.” When a homeless man harasses them for money, Casey freaks out and punches him in the face repeatedly. Nancy tends to the injured homeless man and Marisa asks her not to tell Rabbit. Glenn tells Diana that Nancy is acting weird, and the whole day has been a mess because of all the miscommunication in dispatch. Nancy gets the news that the breast cancer patient passed away, peacefully. Tyler and Boone pack up to go home. Even though Tyler has plans with his other friends, Boone wants to take him out for a quick drink. Tyler apologizes for being difficult. Turns out, Boone isn’t taking Tyler for a quick drink; he planned an entire surprise party for him with all of his friends, including the ones Tyler didn’t think Boone would like. At the hospital, Rabbit visits Casey, who broke his hand in three places while beating up the homeless guy. Rabbit warns Casey not to drag Marisa down with him. Casey defensively tells Rabbit that he has everything under control. All Rabbit wants is for Casey to get help to deal with his issues. At the surprise party, Tyler wears a princess crown and apologizes to Boone again. Tyler wants to know what he can do when Boone’s birthday comes around. Nancy tries to sneak out of the party before she runs into Rabbit, but Glenn stops her. Nancy tells Glenn she doesn’t think she has the life that she wants anymore. Glenn convinces Nancy to come inside for another drink and she agrees. At the party, Nancy drinks shot after shot and ends up getting incredibly intoxicated. She pulls Glenn aside and kisses him, not realizing that Rabbit is watching. Glenn knows Nancy is really drunk and pushes her off, walking away and leaving her all alone. First aired: April 26, 2010. Courtesy NBC. Once again a good show has been cancelled. Trauma and Mercy were both great shows. But of course NBC had to cancel them. SUCH BS!!! Then what does NBC do, they bring new shows on to replace them and can’t even keep those shows on the air. NBC needs to bring them back and include the ppl who dvr the shows. The rates would go way up. Please bring back mercy and trauma!!!!! Too many ppl are disappointed and to leave both shows hanging is crap. Bring them back!!!! !